The following graphic illustrates the layout. 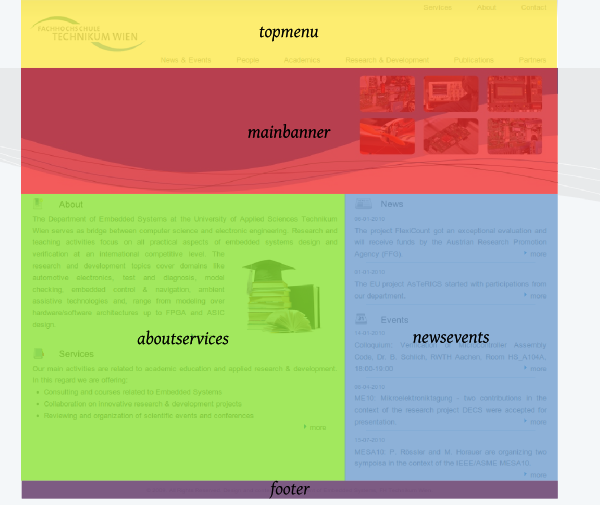 topmenu and footer are the same as for all other pages and are stored ind the directory common. The mainbanner section is defined in the CSS stylesheet /css/embsys.css and basically includes a background image of size 950 x 220 pixels. The file /aboutservices.html contains the static left part of the front-page content. The file /newsevents.html contains teasers for new News and Events. This file shall be maintained by the WEB admin, see here for directions..